I picked this record up on my recent Austin trip, as it is a DIY single put out by a local Austin label and it looked interesting. As you have may noticed this sort of thing is my bread and butter. I asked my friend Matt Owens if he knew anything about them and he described them as "short lived". He is an old Austin guy so he seemed the natual person to ask. This record is pretty fun in a high school pep squad sort of way. The untitled track is the one that features harmonica player Randolph Stockton. Ladies and gentlemen, for your listening pleasure, Zee Teen Titans. 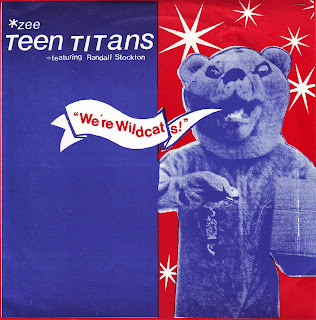 There's another Teen Titans record that I think preceeds this one by a couple of years? Didn't they have a connection to Junior Varsity?